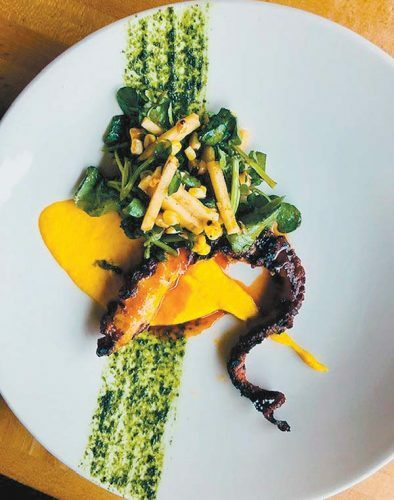 With 46 years as the most acclaimed restaurant on Maui and as one of the top in the U.S., with too many awards to mention here, Mama’s Fish House in Kuau Cove keeps stretching its tentacles to serve the best seafood around. Apparently, “resting on one’s laurels” is not in the vocabulary of founders/owners Floyd and Doris Christenson. These reasons are why Mama’s is often the first place that visitors go for seafood straight off the plane and the last destination they savor before they depart. And it’s why residents flock there for special events such as anniversaries, graduations, birthdays and business successes. “Mama’s is known for wild-caught fish, yes, but it’s also a place you can depend on for quality foods of all kinds. 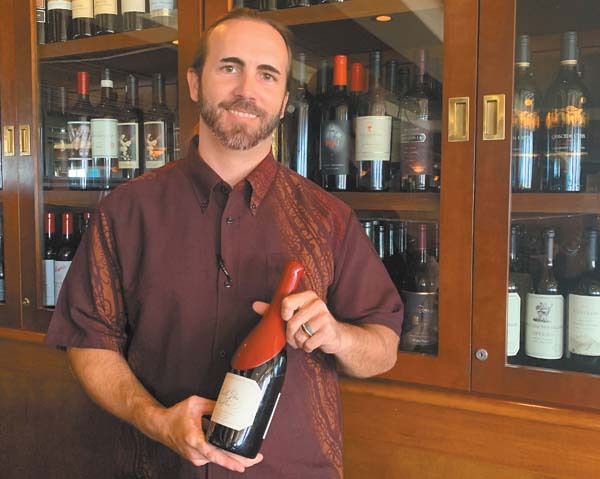 We care about sustainability, and diners here become part of the bigger Maui community, even if they don’t realize it,” says Bateman. 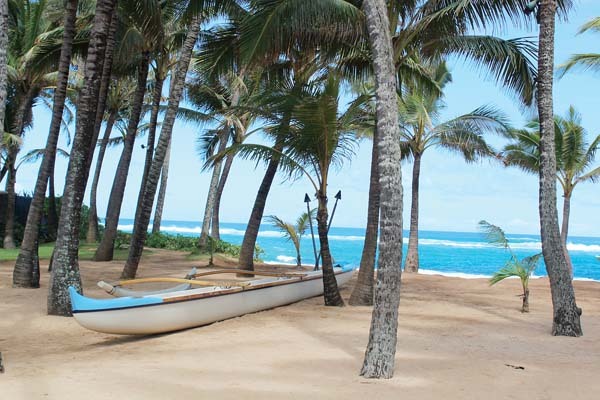 Photo ops of an outrigger canoe in a coconut grove abound. Kulahaven Maui rainbow trout is doing swimmingly well as one of the sustainable fish varieties coming out of Mama’s kitchen these days. Dobovan currently farms about 10,000 trout in Kula. He hatches the trout from eggs at the 3,500-foot elevation. “When Perry first tracked me down, I had like, 10 fish, total,” remembers Dobovan. “There still aren’t enough fish to supply the other restaurants. Our intention is to market it eventually as Maui Trout Co.
“No one has done aquaponic trout in Hawaii before. I find that raising trout is like riding a unicycle or walking a tightrope while juggling razor blades,” he continues, laughing. 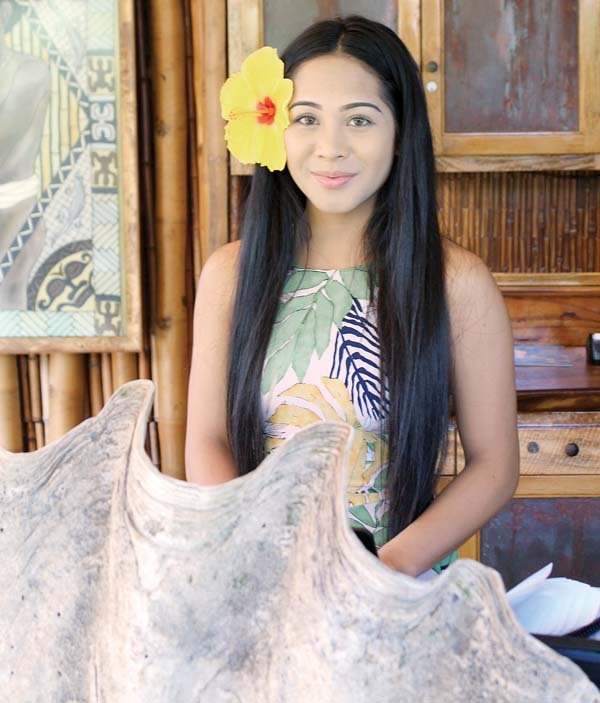 Hostess Kamalei Santos Bras greets guests from behind a giant clam shell. Bateman sings high praises for the trout and diners are taking notice, too. 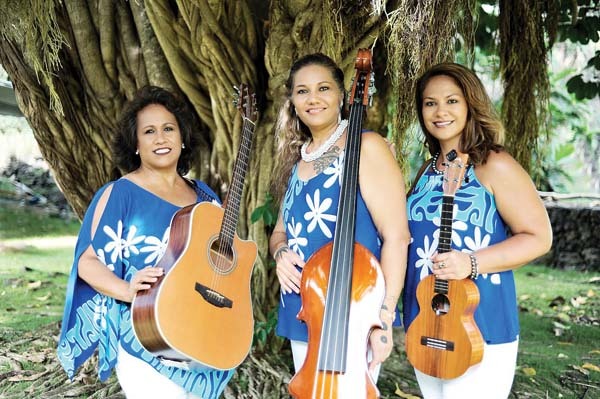 They are starting to opt for it as well as, say, lehi caught off of reefs near Olowalu by Layne Nakagawa or uku caught off of Lanai by Kalae Hickcox and stuffed with deep-sea red crab and baked in a crust of macadamia nuts. 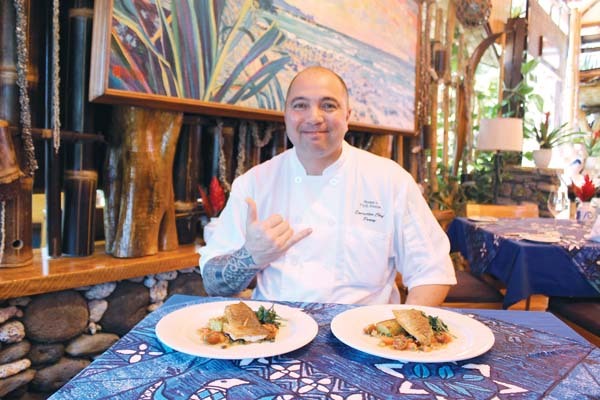 “John’s Maui rainbow trout is delicious. It’s very clean tasting and cooks perfectly. His fish meets our high-quality standards. We have always supported sustainability, so we are very excited to feature the Maui trout on Mama’s menu,” explains Bateman, obviously impressed. Just then, a whole Kula rainbow trout and two fillets arrived at the table with aromatic accompaniments. Dobovan and I wolfed it all down and deemed Bateman’s takes on the preparations winners. One reminded me of a perfect Rocky Mountain rainbow trout that I savored in Aspen many years ago — mild, tender, moist and flaky. 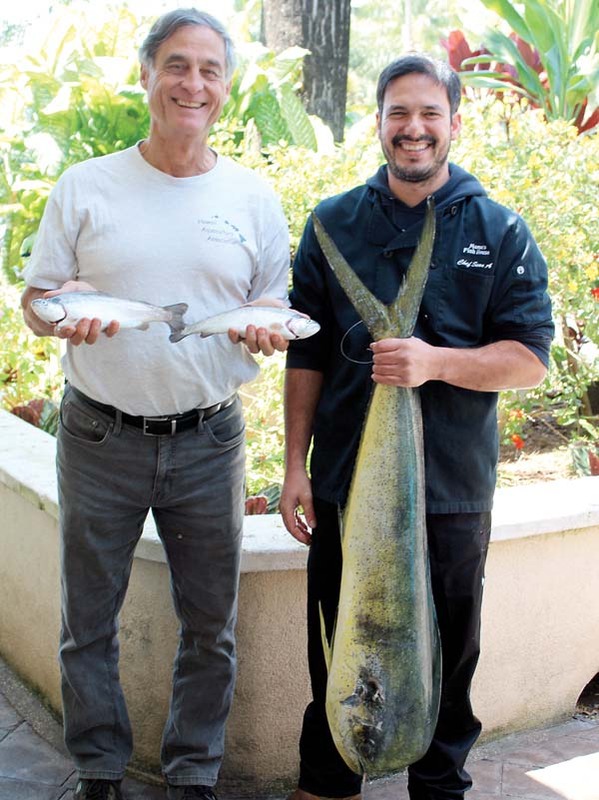 Kulahaven rainbow trout farmer John Dobovan (left) showcases two fish fresh from the tank and Mama’s fish fabricator/purchasing manager Sean Asuncion holds up a 20-pound mahimahi caught by Alan Cadiz at a community buoy. Trout has more omega-3 oils than even salmon. Watercress is a nutrient-dense plant, according to Dobovan, a veritable wealth of information on food. In fact, Mama’s just subsidized another new fishing aggregate device, or FAD, to make it easier for local fishers to hook up in Maui waters on their small boats. 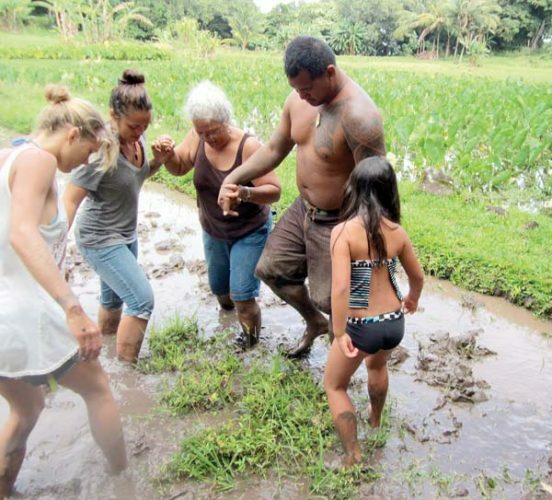 While Mama’s does offer coveted food items such as Tristan Island lobster from the most remote island in the world as well as New Caledonia prawns, it does its best to buy local. Years ago, Bateman fantasized about Mama’s growing all of its own herbs, fruits and vegetables. “Floyd said, ‘Let the farmers do what they do best and we’ll do what we do best,’ “ Bateman explains. Vegetable lovers will find Kula tomato and Maui onion salad with Point Reyes blue cheese and pine nuts. Meat lovers will want wild Maui venison hunted by Jake Muise and roasted as a rack. So come and taste the honey-poppyseed bread baked in house and brought warm to your table. Chefs simmer the amuse-bouche of tomato-ginger bisque and pound the poi, both complimentary to diners. Aunties and tutu sew the Tahitian fabric for the colorful blue tablecloths. Uncles do the gardening. Farmers bring in tropical blooms. Fishers get their names on the menus. 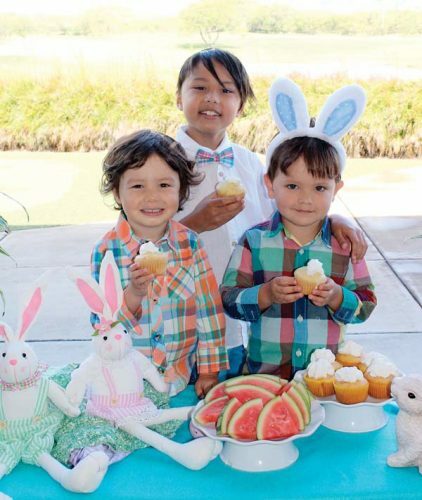 Now Dobovan under Maui Trout Co. does, too. 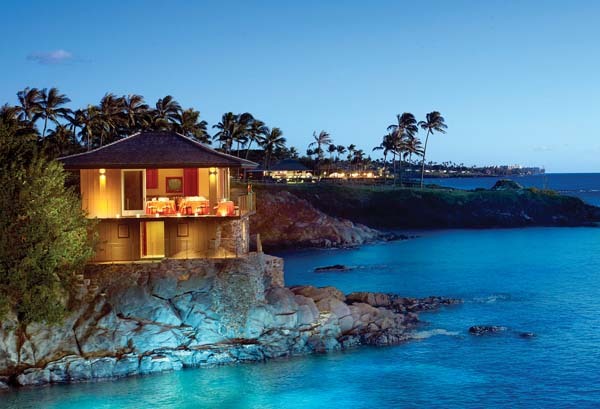 • Where: Located in Kuau Cove on Maui’s north shore at 799 Poho Place. Valet parking. • Hours: Open at 11 a.m. and last seating is at 9 p.m. Both lunch and dinner are the same menus, which rotate daily. • Menu highlights: Kauai shrimp won tons; grilled he’e, or octopus, caught off of Kanaha; Hamakua Ali’i mushrooms with goat cheese; Maui onion soup; traditional Hawaiian fish plate with Big Island wild boar; Maui tempeh with a rainforest banana curry; opakapaka with Hana ginger in hot peanut oil and Tahitian Black Pearl dessert. • For more details: Call 579-8488 or visit www.mamasfishhouse.com.